In some cases it is necessary to delete all entries from Windows event logs on a computer or a server. 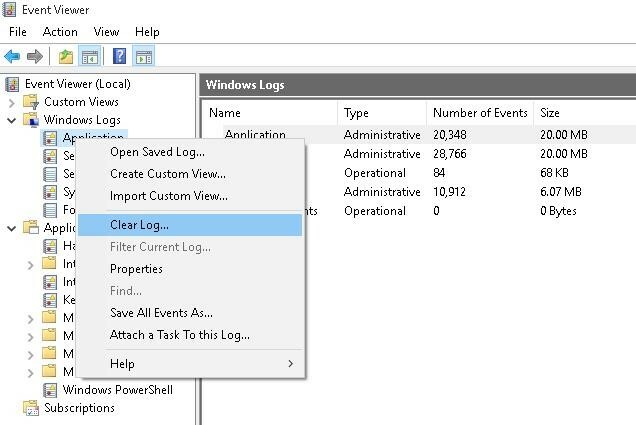 Of course, you can clear the system logs from the Event Viewer console GUI— Eventvwr.msc (right-click the log you would like to clear and select Clear Log). 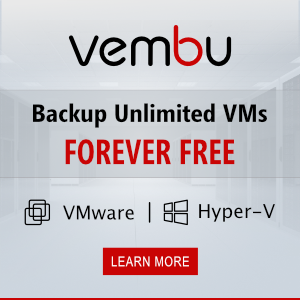 However, starting with Vista, Windows has been using several dozens of logs for different system components, and it is time-consuming to manually clear all of them in the Event Viewer. 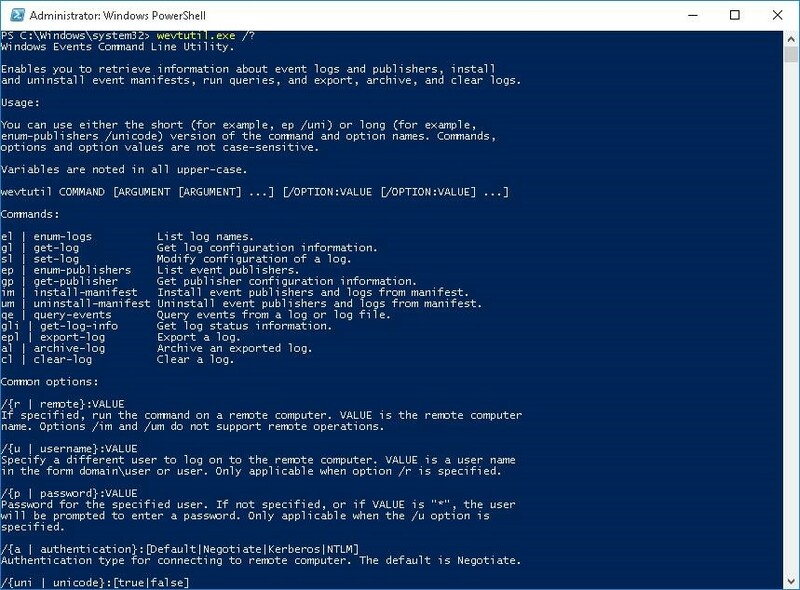 It is much easier to clear logs from the command prompt: using PowerShell or the built-in console tool wevtutil. 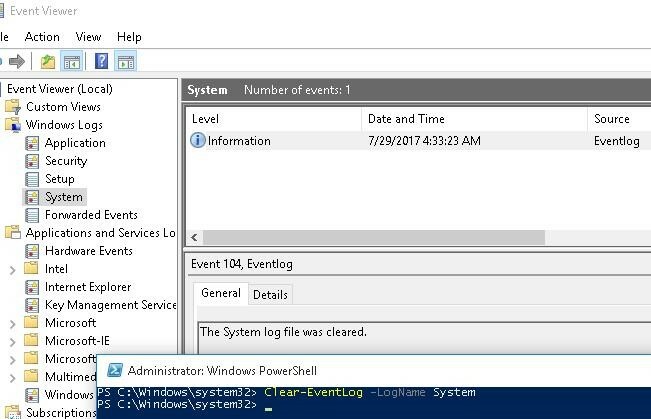 If you have PowerShell 3 installed (by default, it is installed in Windows 8 / Windows Server and higher), you can use Get-EventLog and Clear-EventLog cmdlets to get the list of event logs and clear them. 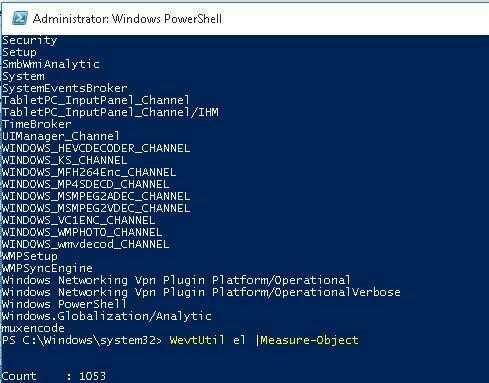 Start the PowerShell console with the administrator privileges and using the following command display the list of all standard event logs in the system with the maximum size and the number of events. As a result, all events of this log will be deleted, and there will be only one event with the EventId 104 and the message “The System log file was cleared“. Thus, all standard event logs will be cleared. Quite an impressive list of logs will be displayed on the screen. Note. You can count how many logs there are using the following command: WevtUtil el |Measure-Object. In my case there were 1,053 different logs in Windows 10. Note. In our example, I was not able to clear 3 logs due to the access error. It’s worth to try and clear them using the Event Viewer.